There weren't many silver linings to Tropical Storm Harvey's wrath, but if you were outside Tuesday you surely felt one: Tuesday's weather broke a 122-year record for the coldest maximum temperature on Aug. 29 in Houston. The high on Tuesday was just 75 degrees, following days of record rainfall from Hurricane Harvey, said Kent Prochazka, meteorologist with the National Weather Service. 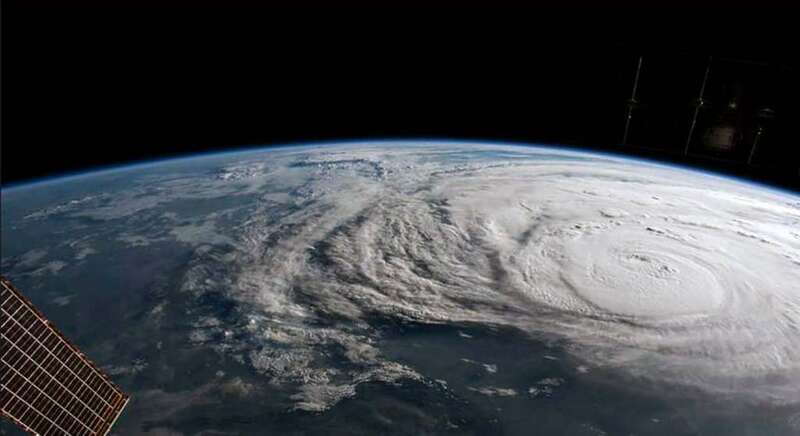 While federal officials said they are expecting a multi-year recovery in Texas and across the south as Tropical Storm Harvey continues its course east into parts of Louisiana, the death toll rose to 20 people, sheriff's said Wednesday. Montgomery County Sheriff's Capt. Bryan Carlisle said two more Harvey-related deaths were reported north of Houston. He said 33-year-old Joshua Feuerstein of Conroe died when he disregarded a barricade and drove his pickup into standing water Monday. Carlisle said witnesses saw the pickup's reverse lights illuminate, indicating that Feuerstein was attempting to back out of the water. But the pickup was carried into deeper water. The witnesses swam to help, but Carlisle says he was already dead. Carlisle says people nearby saw the man sink under the fast-moving water. His body was found a day later in the same area. Earlier in the day, acting Homeland Security Secretary Elaine Duke said Wednesday federal government agencies would help those affected for as long as needed. "We expect a many-year recovery in Texas and the federal government is in this for the long haul," Duke said. "We will help the people of Texas for as long as they need." She added: "This particular storm was unprecedented in terms of volume, of rain, and that's what we're focusing on now." Duke said while officials were monitoring the situation in Louisiana, the focus remained on the greater Houston area, which saw more than 50 inches of rain after Harvey made landfall Saturday. "Catastrophic flooding is likely to persist days after the rain stops," she added. Wtih at least 13,000 rescued in the Houston area and surrounding cities and counties, more people were still trying to escape from their inundated homes. FEMA administrator Brock Long said more than 230 shelters are operating in Texas, housing more than 30,000 people. "We're also calling on other states through emergency management assistance compacts," he said. "We're still in lifesaving, life sustaining mode." He added: "Shelters are obviously not ideal and unfortunately people are going to be there for quite some time." Additional rain flooded shelters in parts of Texas overnight as Harvey made landfall again early Wednesday in southwestern Louisiana - potentially putting New Orleans in the path of another devastating storm on the 12th anniversary of Hurricane Katrina. Some in Houston are climbing into attics to flee rising flood waters, the Houston Chronicle is reporting. "Have reports of people getting into attic to escape flood waters," tweeted Houston Police Chief Art Acevedo, Austin's previous police chief. "Do not do so unless you have an ax or means to break through onto your roof." Those reports were coming from areas along Interstate 45 between downtown Houston and Clear Lake, the Chronicle reported. 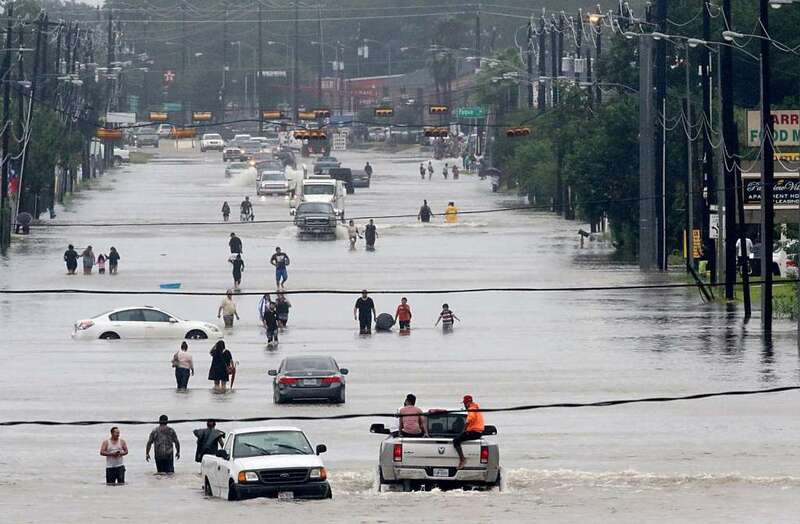 Early Sunday, the Harris County sheriff tweeted that there were reports of several submerged vehicles on Interstate 10 at Lathrop and added that, while it was unconfirmed, crews were investigating reports that one of the vehicles possibly had a deceased woman and child inside. A miles-long string of booming thunderstorms from Tropical Storm Harvey brought torrential rains overnight Saturday that flooded city streets, drowning one person. The rain came down so hard and fast meteorologists at the National Weather Center here declared four flooding emergencies across the metro area, warning residents of dire danger if they left their homes or shelters for the roadways. Rain gauges in some West and Southwest Houston neighborhoods reported receiving upwards of 4 inches of rain in just one hour. Closer to downtown, the rain was nearly as impressive and dangerous, measuring between 2 to 3 inches. Former longtime Houston Chronicle science and weather writer Eric Berger, who now runs the respected Space City Weather blog, tweeted the city was on the cusp of a flooding catastrophe. Floodwaters reached the roof lines of single-story homes Monday, and people could be heard pleading for help from inside as Harvey kept pouring rain on the Houston area after a chaotic weekend of rising water and rescues. 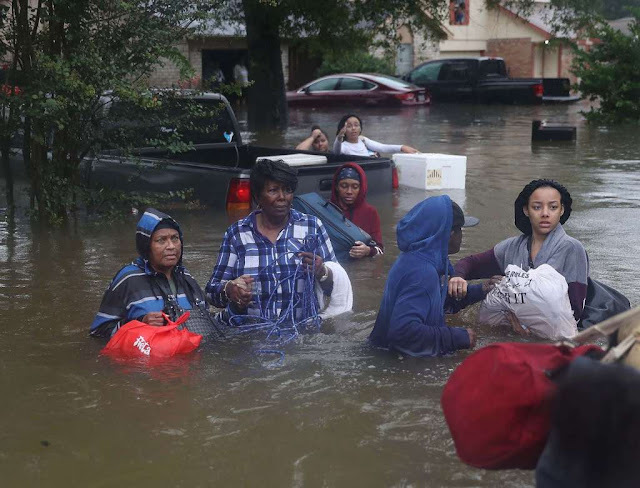 The nation's fourth-largest city was still largely paralyzed, and there was no relief in sight from the storm that spun into Texas as a Category 4 hurricane, then parked itself over the Gulf Coast. With nearly 2 feet of rain still expected, authorities worried whether the worst was yet to come. Gov. Greg Abbott has activated the entire Texas National Guard in response to Harvey, bringing the total number of deployed Guardsmen to roughly 12,000, he said Monday. previously, he had mobilized about 4,000 troops. Houston police chief Art Acevedo says 2,000 people have been rescued from flooding in the city; 185 requests for help are still pending. FEMA Administrator Brock Long said he expects the storm will drive about 30,000 people into shelters, and 450,000 people will seek some sort of disaster assistance. The National Weather Service warns that flash flood emergencies are in effect for some areas and the rain -- which can be measured by feet rather than inches -- is not letting up. Emergency vehicles made up most of the traffic Monday in downtown Houston. The normally bustling business district was virtually deserted. Many traffic signals did not work and most businesses were closed.